They did what for FOUR hours!? Ines and Sam left the competition earlier this month after they were found to be having an affair and cheating on their partners. 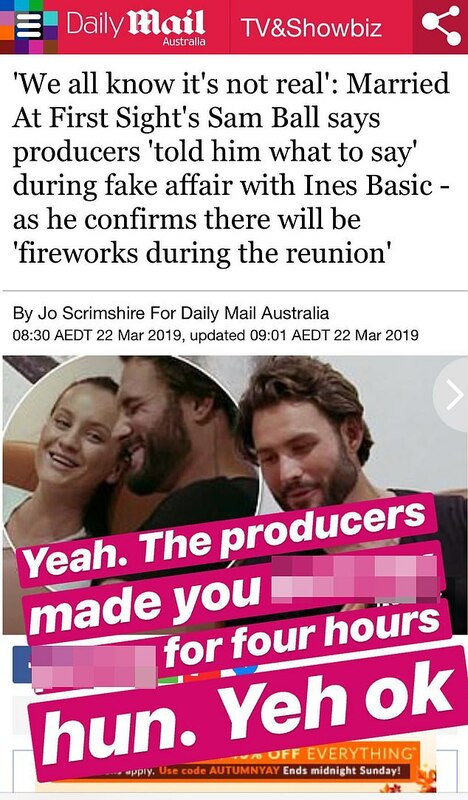 Since then, Sam has claimed he never slept with Ines during their 'affair' and went on to say the whole thing was actually set up by the producers. However, Ines is having none of it and wants to set the record straight. After screenshotting a story where Sam said it was all fake, Ines shared the most x-rated details of their relationship saying that he went down on her for FOUR hours. Posting on Insta, Ines wrote "Yeah. The producers made you eat my p--- for four hours hun. Yeh ok."
For all the Married At First Sight gossip you will ever need, visit our MAFS hub page and enjoy all the drama.